What I love about this assignment is that it can be adapted to almost any topic that you want students to walk away with messages promoting positive thoughts, actions, and attitudes! I initially created this to use when teaching about healthy dating relationships and after using it thought of umpteen other lessons that I could use it with. So let me give you some background and suggestions for implementing this and then let your students have at it as they develop their own original slogans, messages and images about whatever topic you assign. This is also a great template to use when running a design contest for club t-shirts or fundraisers! As mentioned previously, I used this project when teaching about healthy dating messages. It all started when I was driving along and saw a “Pass It On–Civility” billboard from Pass it on titled “When push comes to shove, don’t!” I thought to myself that the slogan would make a great t-shirt message! So I created a template for both males and females, assigned it to my students and had them go to work, designing their own original slogans and images. Now, students are clever and can totally come up with their own slogans, but I do encourage them to act as sounding boards for each other. Who do you want to view this message? What do you want your viewer to walk away with, understand or do? Why is this an important message to share? 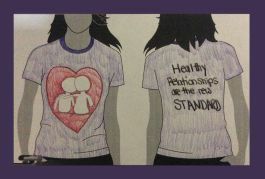 Does the t-shirt message and design show a direct relationship to the assigned topic or concept? Is the message clear and concise and have a definite call to action or is it vague and confusing, making you unsure of what to think or do? If you had to offer one suggestion for improvement, what would it be? Why? Once the peer evaluations are complete, students can begin their messages and designs. I encourage my students to add color by providing them colored pencils, oil pastels and markers. When t-shirts are complete, students share with the class and I hang them up for display around the room or even outside my door for the student body to read! If you are a 1:1 school and wish to have your students create a digital “Pass it On” message about a particular topic, the Pass it On website has a “Create Your Own Billboard” feature. Students just need to create the phrase/message and upload a photo and submit it to the website. I had my students do this one time, several years ago, for bonus points.